Western Australian researchers are conducting a global initiative to evaluate the importance of sharks for conservation and economic development, in a bid to slow global declines in shark numbers. 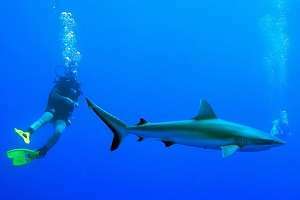 Researchers at the University of Western Australia's Oceans Institute are collecting data for a valuation of shark populations in Australia, following the success of similar studies in Fiji, Borneo and Palau. The studies aim to provide a socio-economic valuation that may make shark conservation economically attractive for decision-makers, focusing on describing the economic benefits of tourism when compared to commercial fishing. Lead researcher Gabriel Vianna says shark fishing is a major problem around the world, causing shark populations to decline by more than 90 per cent in some areas. "The hunger of the Asian market for shark fins has been responsible for stimulating local fishers in distant areas such as Africa, Central and South America or even remote islands of the Indo-Pacific to catch sharks for the export of fins," he says. "This combined with the large catches of sharks by commercial fishing fleets around the world has caused massive declines in many shark populations." In the Asia-Pacific, recent studies have revealed significant declines of populations previously considered to cope well with commercial fishing. Researchers warn this shows current catches of sharks are not sustainable for many species and need to be better regulated. "This kind of study is important as it shows a different side of conservation, it shows that besides being extremely important for marine ecosystems, sharks may also be good business partners," Mr Vianna says. "A well-managed shark diving-industry can generate significant revenues to the economy and assist the livelihood of local communities." As part of the study, researchers have compiled a survey to collect information from the dive tourists and dive operators, and are conducting further research to assess the scale of the industry. Part of Mr Vianna's research also explores the diving industry's interactions with sharks, including assessing the role divers can play in monitoring shark populations. "The coast of WA has many species of sharks of potential interest for the diving and shark-diving industries such as reef or coastal sharks," he says. "Some of these species are also caught by recreational fishers or exploited as fisheries resources. "This overlap needs to be taken into account by management and conservation strategies and the discussion with the stakeholders and scientific community is usually a good way of deal with the conflicting interests."